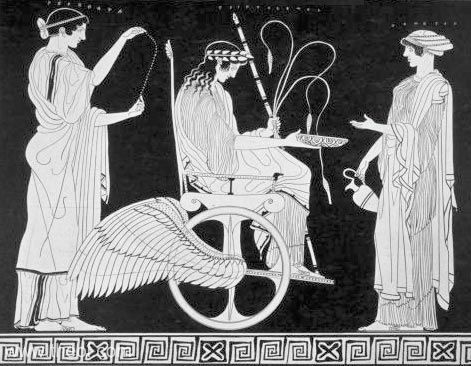 Triptolemus departs in a winged chariot to instruct mankind in the ways of agriculture. He is flanked by the goddesses Persephone and Demeter. The hero holds a royal sceptre and sheaf of grain in one hand, and a drinking cup in the other. The goddess Demeter bears an oinochoe jug.